The Burren is a landscape and ecosystem that was at least partially created by man, but certainly maintained by the farming community and the traditional methods of management that were, and still are, being employed. It is important to remember this and appreciate the difficulties that were overcome by the farmers in order to make a living out of this rocky landscape. Traditionally cattle and sheep were the main stock herded in the Burren, also kept were pigs, fowl and goats. Most farms had a few goats with their herd, these were used for milk and also for meat. The goat is often called the “poor man’s cow” as the milk from the goat helped many families survive through harsh times. Few farms still herd goats but the descendants of these goats can still be seen today, they roam free across the Burren as herds of feral goats. 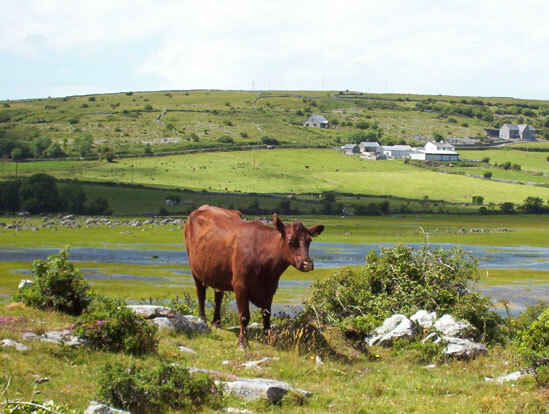 The main impact of farming in the Burren is due to a method of farming called transhumance. This is where the stock is moved from the uplands to the lowlands at different seasons depending on the weather and availability of food. In the Burren, this is the reverse of most places as the stock graze the uplands (winterages) in winter and the lowlands in summer. In winter, the lowlands are often waterlogged or covered by turloughs, these areas are dry for most of the summer and due to their inundation of water in the winter they have very lush vegetation. There is little available water in summer on the uplands, this is because there are no rivers in the Burren (except for the Caher River in the northwest), so the only available water in the uplands is after rain when the springs are full. These springs occur along the bases of crags and cliffs where the water has seeped down through cracks in the rocks until it reaches an impermeable layer. It then travels horizontally until it emerges on the terraces as springs, the water from these springs then disappears underground again to reappear lower down the slopes or in the turloughs. The rock acts as a giant storage heater. In the summer it absorbs heat from the sun and releases this heat in the winter. These rocky areas are therefore slightly warmer than other upland areas in the country. The rock provides enough heat to increase the growing season therefore providing enough grazing for the stock through the winter. The reason the Burren has such a great diversity of plant and floral species is because the stock graze the winterages hard, leaving very short grass. The stock are taken off in the spring before the first flowers are ready to emerge. Because the grass is short coming into spring it enables the floral species to emerge without having to compete for space, light and resources. The stock are not put back onto the winterages until late autumn enabling the flowers to thrive un-trampled and un-grazed to set seed through the summer. The winterages have some shelter on them but you can see man-made shelters on the more exposed winterages, these consist of stone walls usually double and often T-shaped or L-shaped so there will always be shelter on one side of them. Farming systems are dynamic and change through time depending on advances in technology, changes in climate and changes in the economy. Farming in the Burren is no exception to this and often changes in the farming systems effect the habitats and ecosystems. Farming in the Burren has undergone many subtle changes through its history. Most recently (in the 1980’s), landowners were being given grants by the government to reclaim land. This involved large-scale reclamation of limestone pavement and species-rich grassland. Due to changing policies, farmers are now being grant-aided, through the REPS scheme (Rural Environmental Protection Scheme) to preserve the natural habitats in the country. In recent years, Burren farming has become more specialised and intensive, and also concentrated in the fertile valley regions. The numbers employed in the farming sector have dropped by 52% over the period 1970 – 1996. Currently, there are approximately 250 farm workers in the Ballyvaughan Rural District, 850 less than in 1935. There are also relatively few fulltime farmers, it is hard to make a living purely from farming so many people have off-farm jobs and do the farm work at weekends and in the evenings. The amount of available time for tending the stock and maintenance is therefore limited, leading to the present day low maintenance systems of farm management. Stock types and ages have also changed in recent times. The traditional breeds (Longhorns, Shorthorns) have been replaced primarily by continental breeds such as Charolais, Simmental and Limousine. Traditionally, cattle from two to six years of age were kept, as they are better suited to grazing the rough grasses.However now most cattle are sold as weanlings. The changes in breeds and ages has led to an increase in supplementary feeding which in turn leads to a decrease in the roaming, browsing and grazing of the cattle. The continental breeds need a higher nutrient intake than the traditional breeds. These changes have been market driven; it is not cost effective in the current European market for the traditional breeds to be maintained. Largely due to these changes in farming practices the balance within the ecosystem has been changed. There has been, and continues to be, an increase in hazel scrub and a decrease in the species diversity of the winterages. Also adding to the increase in the abundance of scrub is the decrease in human pressure on the land e.g. people taking wood for fuel, cooking, thatching etc. There is also less available time to manage the land in its traditional way. Many members of the farming community would like to spend more time on their land but the reality of economics prohibits this. There is currently a ‘Life’ funded project taking place in the Burren, titled “Farming for Conservation in the Burren”. This project is looking at the current farming management of the region and trying to develop a sustainable farming system that is also beneficial to conservation. This is due to run until 2009.